Each year, I see the sales ads: Heirloom tomatoes on sale, only $2.99/lb. Customers flock to them. The pictures show huge, lumpy, full-color tomatoes instead of the common round red variety. Whole Foods staffs the produce department with sales people who can name all of the different varieties of heirlooms tomatoes that they sell. But many people think heirloom tomatoes are just fancy, colorful, high-priced produce. In reality, “heirloom” is a variety of plant in which the seeds can be saved and planted to produce offspring of the same variety. The strain can be thousands of years old or newly developed. Unlike hybrids, which cannot reproduce into the same variety, heirlooms guarantee seed propagation. In the mid-1800s in Ireland, overpopulation and bad living conditions already stressed people who depended solely on the potato for food. The blight Phytophthora infestans arrived in Europe around 1844. By autumn of 1845, it had spread through the greater part of northern and central Europe. In Ireland, crop loss in 1845 was estimated at anywhere from one third to one half of cultivated acreage. In 1846, more than three quarters of the harvest was lost to blight, and the first deaths from starvation were recorded. As over 3 million Irish people were totally dependent on a few varieties of potato, famine was inevitable. Historians estimate a million deaths from starvation and disease between 1846 and 1851, and a million other emigrants out of Ireland. 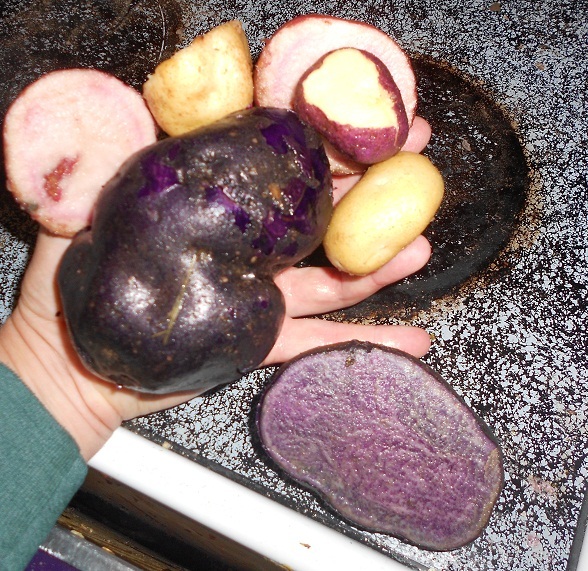 As I chose my potatoes this year, I read among the descriptions of the different varieties: “Resistant to blackleg and fusarium storage rot; immune to wart;” “Resistant to hollow heart, moderately resistant to scab;” and “Moderately resistant to early blight.” How would the Irish Potato Famine have been changed if the people had cultivated thirty different varieties of potato instead of just a few? I plant Painted Mountain Corn, which had been developed over the course of 30 years by Dave Christiensen. He hoped to aid high-stress horticultural regions in which other varieties of corn fail. Dave has received reports of good production of his corn from every part of the U.S., and even from Siberia to South Africa. Though attracted by the color, I purchased Painted Mountain corn for the primary reason that it had developed in Montana, where the growing season is shorter than the crazy one we endure here. Reno’s summer isn’t long enough for most Indian corn. How does Painted Mountain thrive? The pictures of stalks and kernels are your answer. In the 70s, scientists discovered how to modify genes, transferring them from one organism to another. By transferring the DNA from a creature that could survive in the cold, such as a flounder, into a tomato, they could create a tomato to be more frost resistant. The results, however, aren’t so rosy. In the 1990s, Dr. Arpad Pusztai fed supposedly harmless GM potatoes to rats. Within just 10 days, the rats developed pre-cancerous cell growth, smaller brains, livers, and testicles, and damaged immune systems. In 2004, virologist Terje Traavik presented preliminary data at a UN Biosafety Protocol Conference, showing that Filipinos living next to a GM cornfield developed serious symptoms while the corn was pollinating. One biotech company engineered a soybean with a gene from a Brazil nut, to aid in pest resilience, since Brazil nuts are not prone to bug infestation. Many people are deathly allergic to Brazil nuts. If they encountered Brazil nut genes in tofu, they could have a serious reaction. Luckily a laboratory test picked up the allergen and the soy never made it to our supermarkets. In 1999, a Saskatchewan farmer named Percy Schmeiser was sued by Monsanto for $145,000 for having some of Monsanto’s patented canola plants on his 1,030-acre farm. Patented in the early 1990s, the Monsanto variety had a specific gene to allow farmers to spray Roundup, a devastating herbicide, all over the crop. Basically, everything died but the canola. How did Percy Schmeiser get the seed, if he hadn’t bought it from Monsanto? Canola is one of more than 3,000 species within the mustard family, which pollinates by insect or wind. Patented genes travel in pollen, creating seeds that can remain viable for up to ten years. If a farmer’s fields contain the patented seed, and he has not purchased it, it’s illegal to harvest them. He also cannot save the seeds for future crops. Because of pollen drift and seed contamination, nearly all Canadian canola is tainted with Monsanto genes. Percy lost his court battles. He continued to lobby for change, and his cause was lost again in a recent Congressional decision to uphold genetically modified crops. When an insect or disease infestation occurs, a plant responds by manufacturing its own disease/pest-fighting compounds. These compounds turn into antioxidants for us. The same antioxidants that fight diseases and pests in the plant leaf work in the human body to protect us against various diseases, cell aging, and tumor growth. By choosing heirlooms, including heirloom tomatoes, you choose a variety whose ancestors have already done the toughening, creating green shoulders or purple skin, or maybe a red tinge on the high parts of the leaf. A bitter flavor, perhaps, that repels bugs but offers high levels of vitamins. A few years ago, I received several emails offering to sell me packets of non-hybrid seeds. The sales pitch was good: preserve your food in the event of famine, giving yourself sustainability as you collect seed year after year. The packets of seed were expensive. I could imagine many amateur gardeners buying that packet and saving the seed for ten or more years, believing they were protecting themselves from famine or apocalypse, but not knowing they could simply grow heirloom varieties and save the seed year after year. A little knowledge is necessary for saving your own seed, though. For instance, I grew five varieties of squash in my garden last year. My Small Wonder, Hunter, and Carnival squash were hybrid, so that seed was invalid for saving. That left two varieties. While researching how to save seeds last year, I learned that all squash varieties stem from five specific species. Any squash within the same species can cross-pollinate, creating a mutant squash-child. Small Wonder, Carnival, sugar pumpkin, and Black Beauty all fit within the variety cucurbita pepo, allowing cross-breeding. My hunter squash (butternut) was a hybrid variety. Basically, I was out of luck. I had two heirloom varieties, but I would need to plant them more than ¼-mile apart to successfully save the seed. 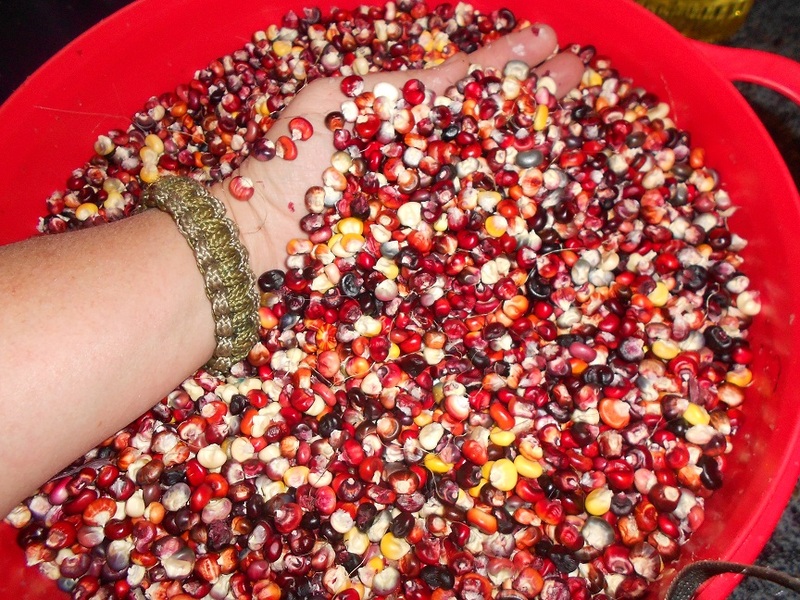 Painted Mountain Kernels, ready to grind, October 27, 2012. 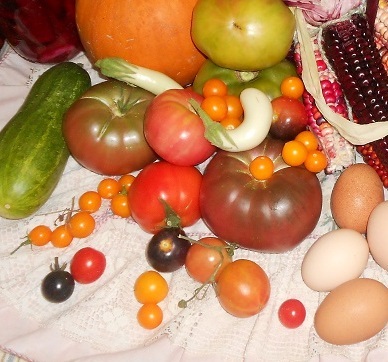 Several friends have approached me regarding heritage tomatoes and other heirloom vegetables. One friend, an avid history buff, wanted to raise carrots, “before the Dutch turned them orange.” Another wanted to grow varieties her ancestors in Eastern Europe grew. The Seed Savers’ Exchange was founded by Diane and Kent Whealy in hopes of preserving some of our heritage varieties, after Diane’s grandfather left her seeds to some pink heirloom tomatoes brought back from Bavaria in the 1870s. Their network has grown to more than 8,000 members, which grow, save, and exchange more than 11,000 varieties of heritage plants. Growing these heritage plants helps keep them available as gardeners develop a taste for them, consumers buy them, and seed is shared around. Last year, I bought three varieties from Seed Savers that I had never heard of before: Cream Sausage, a light yellow paste tomato and one of my new favorite types of heirloom tomatoes; Blue Jade corn, a dwarf sweet corn that is steel blue while fresh but jade green after boiling; and Jacob’s Cattle bean, which is a white and burgundy spotted bush bean used for soups. Last June, scientists discovered another reason why some heirloom tomatoes taste better. Genetic mutation of tomatoes in 1930 had produced a completely red fruit, making an aesthetically pleasing product for supermarkets. Elimination of “green shoulders,” a resistance to ripening at the very top part of the tomato, had also eliminated essential chloroplasts which converted sunlight into sugar for the plant. By getting rid of the green shoulders, we had lost a lot of sweetness in our tomatoes. Consumers don’t realize this, though; they see that color variation as a sign of an under ripe tomato. Green shoulders on a Cherokee Purple and a Black Krim tomato. This year, I started 14 varieties of heirloom tomatoes. A friend donated five more to my for-charity seedling sale. Very soon after announcing my seedlings, and still two months before the seedlings would even be available, friends clambered to get on the reservation list. Most didn’t know which heirloom tomatoes to choose. When they asked my advice, I was able to tell them, “Black Krim is rich and meaty, but needs to be eaten immediately. Cherokee Purple is sweet, but Pineapple is really tangy. Ananas Noir is pleasant, but not distinct enough to hold its own if eaten individually. Indigo Rose is prolific, but very mild and not spectacular in flavor.” This is very different from descriptions you’ll get from your average supermarket tomato. When was the last time you sliced a red hothouse tomato and ate all of it before it even touched your burger, just because it was so scrumptious? I don’t recall a single time. Popular heirloom tomatoes include Cherokee Purple, Pineapple, Aunt Ruby’s German Green, and Black Krim. Popular among those who love growing carrots are Scarlet Nantes. Try Bull’s Blood for growing beets from heirloom seeds. 5-color silverbeet is another term for the rainbow Swiss chard I love so much. Italian varieties of squash can be heirloom, such as Black Beauty. 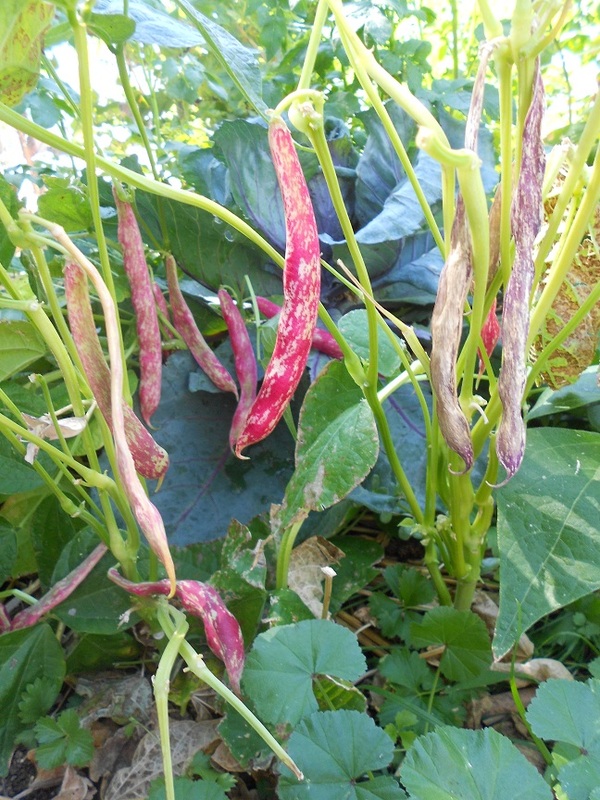 Beans: try Kentucky Wonder or Purple Podded Pole Bean. Lettuce: a wild garden mix contains heirlooms. 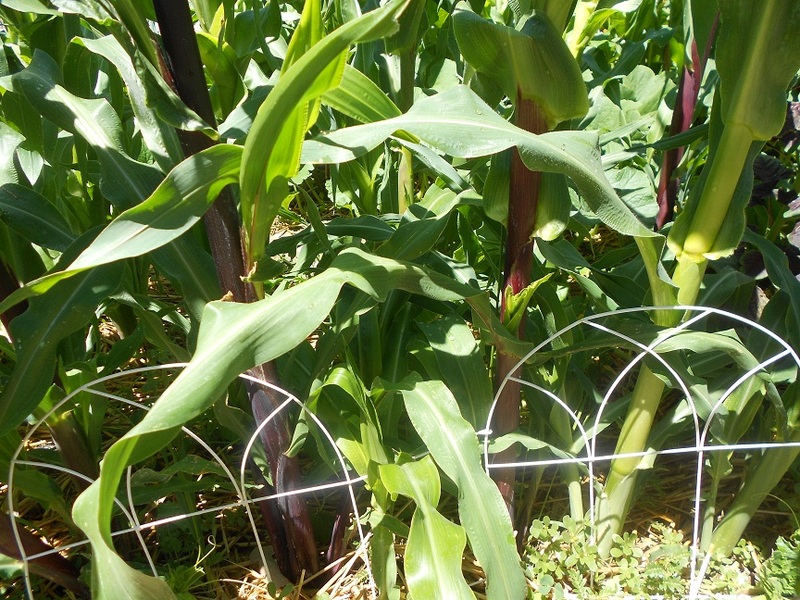 Try Blue Jade for a sweet corn, or either Painted Mountain or Blue Aztec for a flour or meal corn. Rosa Bianca is my favorite heirloom eggplant. You can’t beat the original Mexican standbys for peppers: Anaheim and a real open-pollinated jalapeño. Be sure to read the descriptions for these peppers, though, because hybrid varieties of both Anaheim and jalapeno are widespread. Where do I get my heirloom seeds? Do you have any experience or advice for those of us who want to save our heirloom seeds? Leave a comment and share your stories, advice, and wisdom with us! 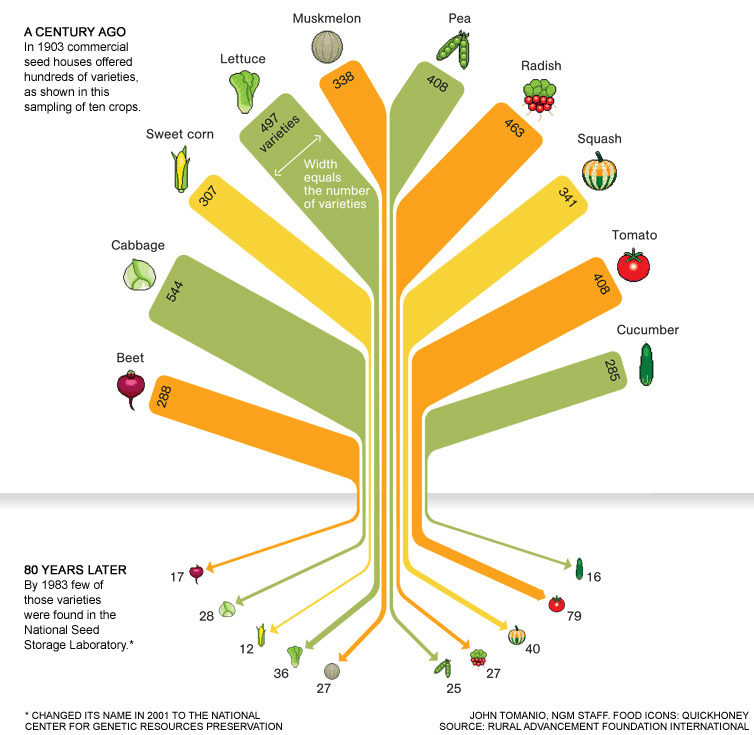 1800s, a, and, breeding, cattle, cold, cucurbita, does, eating, Essential oils, experience, for, fresh, fruit, genetic diversity, growing, growing beets, growing carrots, head, heirloom tomatoes, heritage, heritage tomatoes, how, how. to, in, Kent, last, list, long, most, plant, plants, popular, regions, squash, squash varieties, that, the, to, tomato, tomato growers, tomatoes, whole. What's The Big Deal About Heirloom Tomatoes?